In the beginning of this year 2010, I was pleased to hear that Yamaha was interested to free us of the doodh-wali-bikes. They showed very high interest for their proposal, the interest can be weighed by the frequency of patience they embraced by pursuing the Pakistani Government for the whole damn year before finally giving up, all due to the lack of interest(actions) shown by our government. We have known Yamahas widely as the transporters of milk to our door steps but there was Yamaha OX99-11 before the McLaren F1. Although Yamaha was not doing well in F1 but they did have an F1 program whose expertise it used to built the OX99-11 but due to financial crisis going on in Japan at the time of its development, Yamaha thought it would not attract buyers and axed the project. The OX99-11 had the Yamaha’s F1 engine which was being used by Brabham at that time. A detuned version of the V12 engine producing 400 bhp was being used for the OX99-11. Seating arrangement was tandem, the passenger sat behind the pilot, it was in the middle just like McLaren but however McLaren F1 made it and the OX99-11 didn’t. Apart for making F1 engines, Yamaha also made V6 and V8s for other companies as well and also tuned engines for Toyota – most notably; 2ZZ-GE used in Lotus Elise, Exige and Toyota Celica. Yamaha unlike Pak Suzuki had shown high interest early this year for expanding their current investment in Pakistan by investing 150 million dollars to manufacture bikes and its engines over here, for export and domestic consumption – also include training facilities. The whole program was divided in 3 phases (1) injection of 4.3 billion yen, which would include training of personnel and production. (2) Injection of 7.4 billion yen and (3) injection of 3.3 billion yen, which would include 90 percent localization of their manufacturing. Yamaha Japan’s General Manager Ito Yasushi further told that they would make Pakistan the hub factory for export. However, at that time, our BoI(Board of Investment) Chairman, Saleem H Mandviwalla, welcomed the investment and what not but since our Automobile policy doesn’t include motor cycles, Yamaha’s plan to commence from 2010 seems in trouble. In November Yamaha again pushed BoI to make relevant changes in the policy to allow new entrants in the motor cycle market. Yamaha has already developed such services in Indonesia but our own Government which begs for trade around the world is the main hurdle for Yamaha’s program in Pakistan. Pakistan is a country which supports 100% repatriation of profits to foreign investment hence makes it very ideal for foreign companies, and the new entrant policy is getting revised; and it seems that revisal is only for auto-mobile industry and more importantly to engage China in our market to break the monopoly of our local assemblers. 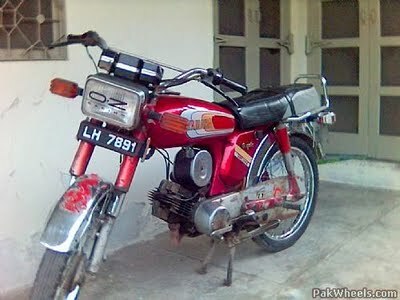 Maybe Government had forgotten the great plan of Yamaha’s investment in Pakistan because there is no word regarding motor cycle entrant policy in those press releases but I hope I am wrong and we get to bid farewell to the still-new-100-year-old doodh-wali-bikes.